Combine the egg, flour and zucchini in a medium bowl. Add half of the avocado and gently stir to combine. Season with salt and pepper. Spray a large non-stick frying pan with oil spray. Place over medium heat. Into a hot frying pan, spoon in 4 heaped tablespoons of mixture and spread out well. Cook for 1-2 minutes on each side, or until golden brown and heated through. Transfer to a plate and repeat with remaining mixture. 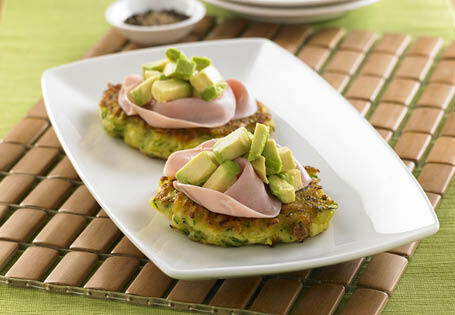 Top each fritter with remaining avocado and ham. Serve immediately. TIP: You can also serve these with a side of baby spinach, a wedge of lemon and tablespoons of natural yogurt.